"Silver City Cut Glass Co. / Silver City Glass Co.
Diamond Glass-ware Co., and Silver City Glass Co. (silver trim). (c. 1930). Saucer with silver trim. (Cat. no. 2016.4.2. Viewed 3 July 2018. G02189-90). Silver City Glass Co. (c. 1930). Luncheon plate, with silver trim. (Cat. no. 2016.4.3. Viewed 3 July 2018. G02257-58). Styled by Silver City Glass Co. (c. 1951-78). Candy dish. Glass with silver overlay. (Cat. no. 04.9.97. Viewed 3 July 2018. G02163-64). Styled by Silver City Glass Co. (c. 1951-78). Relish dish. Glass with silver overlay. (Cat. no. 2013.129.6. Viewed 3 July 2018. G02245-46). Silver City Glass Co. (c. 1951-78). Relish dish. Glass with silver overlay. (Cat. no. 2016.68.2. Viewed 3 July 2018. G02253-54). Silver City Glass Co. (c. 1951-78). Lamp chimney. Clear glass with silver overlay. (Cat. no. 2013.129.9. Viewed 3 July 2018. G02249). Museum of American Glass in West Virginia, Weston. Styled by Silver City Glass Co. (c. 1951-78). Glass frog. Glass with silver overlay. (Cat. no. 2013.129.3a-b. Viewed 5 July 2018. G02260). Styled by Silver City Glass Co. (c. 1951-78). Candy dish, no. 1141. Glass with silver overlay. (Cat. no. 2013.129.1. Viewed 3 July 2018. G02244). Silver City Glass Co. (c. 1951-78). Ashtray, with silver overlay. (Cat. no. 2013.129.5. Viewed 3 July 2018. G02243). Silver City Glass Co. (c. 1951-78). Tumbler with silver overlay. (Cat. no. 2013.129.8. Viewed 3 July 2018. G02238). Silver City Glass Co. (c. 1951-78). Decorative bowl. (Cat. no. 04.9.179. Viewed 3 July 2018. G02240). Styled by Silver City Glass Co. (c. 1951-78). Candy dish. (Cat. no. 2013.129.2a-b. Viewed 3 July 2018. G02188). Silver City Glass Co. (c. 1951-78). Serving bowl with silver overlay. (Cat. no. 2013.129.7. Viewed 3 July 2018. G02185). Viking Glass Company / Silver City Glass Co. (c. 1955). Jelly dish. Clear glass. (Cat. no. 04.9.97. Viewed 3 July 2018. G02162). Silver City Glass Co. (c. 1955-56). Ashtray, no. 983. Clear glass, with silver overlay. (Cat. no. 2016.4.1. Viewed 3 July 2018. G02251-52). Silver City Glass Co. (c. 1958-65). Sugar bowl. Glass. (Cat. no. 2016.1.627. Viewed 3 July 2018. G02186-87). Silver City Glass Co. (c. 1959-78). 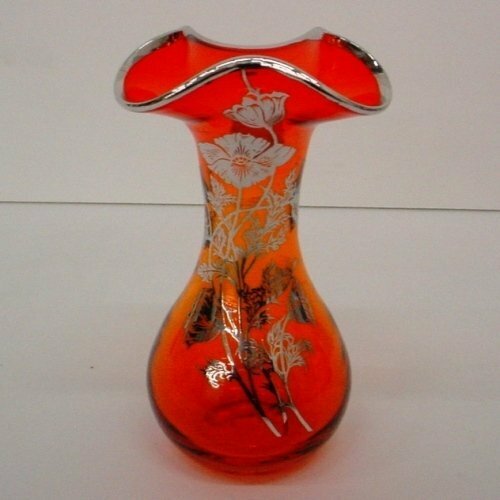 Vase with silver overlay, no. 30. (Cat. no. 2013.129.4. Viewed 3 July 2018. G02197). Styled by Silver City Glass Co. (c. 1962). Decorative bowl. Glass with silver overlay. (Cat. no. 2015.1.247. Viewed 3 July 2018. G02250). Silver City Glass Co. (1970). Christmas plate. Clear glass with silver overlay. (Cat. no. 2012.194.2. Viewed 3 July 2018. G02194-96). Silver City Glass Co. (1970). Christmas plate. Clear glass with silver overlay. (Cat. no. 2015.29.11. Viewed 3 July 2018. G02247). Silver City Glass Co. (1970). Christmas plate. Clear glass with silver overlay. (Cat. no. 2015.29.15. Viewed 3 July 2018. G02256). Silver City Glass Co. (1971). Christmas plate, with silver overlay. (Cat. no. 2015.29.12. Viewed 3 July 2018. G02242). Silver City Glass Co. (1971). Christmas plate, with silver tray. (Cat. no. 2015.29.13. Viewed 3 July 2018. G02241). Silver City Glass Co. (1972). Christmas plate. Clear glass with silver overlay. (Cat. no. 2013.158.1. Viewed 3 July 2018. G02248). Silver City Glass Co. (1972). Christmas plate, clear with silver overlay. (Cat. no. 2015.29.14. Viewed 3 July 2018. G02239). Silver City Glass Co. (c. 1973). Ashtray. Glass with gold decoration. (Cat. no. 2017.1.353. Viewed 3 July 2018. G02255). Silver City Glass Co. (c. 1970s). Decorative bowl. Glass, silver. (Cat. no. 2015.1.518. Viewed 3 July 2018. G02191-93). See documentation in design catalogues and historical information below. 1937 - exhibit at G. Fox & Co.
> Unspecified designs displayed by Silver City Glass Co.
1939 - exhibit at G. Fox & Co.
21 January 1939 - date unknown. G. Fox & Co. Housewares Exhibition, presumably Hartford, CT. (Viewed 21 October 2018. D00350-51). > Glass engraving and depositing silver on glass demonstrations by Silver City Glass Co., and presumably exhibited designs. > Unspecified designs exhibited and / or displayed by Silver City Glass Co.
> Unspecified designs presumably exhibited by Silver City Glass Co.
1941 - display at G. Fox & Co.
> Unspecified designs displayed by (presumably) Silver City [Glass] Co.
Corning Museum of Glass, Corning, NY, Range 9, Bay 1, Shelf 6, Jay and Micki Doros collection, Box 5, Folder S.
For more possible historical accounts, see Meriden-area history books online. For more maps, see historical Meriden maps. Click the following link to see designs and documentation for other historical glass companies from the Meriden area on the historical Meriden design overview page. Scroll down to section B: "ISC, predecessors & divisions - Meriden Cut Glass Company" and C: "Other featured companies". Please note that many of the listed historical silver companies also at times included glass in their designs. (13 January 1921). The Pittsburgh exposition [with mention of Silver City Glass Co.] pp. 16, 20- presumably p. 23. (Viewed 10 December 2018. D00449). "[The] full line" was exhibited, including "Deep cut floral and mitre cuttings are to be had on a rich lead blank, the color of which is a beautiful white body. This is the first time this line has been exhibited at Pittsburgh, and as a result is looked upon as one of the big features of the Exposition." Samuel Newson & Co., Hartford, CT. (5 December 1926). Advertisement: "... We fortunately purchased the entire surplus stock of art glassware from the Silver City Glass Co. ..." [with no illustrations]. Hartford Courant, p. A10, cols. 5-8. (D00304-05). (5 January 1928). List of exhibitors at Pittsburgh Show, January 9 - 21, Associated Glass and Pottery Manufacturers [with mention: William Penn Hotel... The Silver City Glass Co., Inc., Meriden, Conn. ..." Crockery & Glass Journal, p. 36. (Viewed 26 October 2018. D00459). Stephens Jeweler, presumably Lowville, NY. (5 December 1929). Advertisement: "... Silver City Glass... " [with no relevant illustrations]. The Journal and Republican (Lowville, New York). presumably p. 2, cols. 1-2. (Viewed 14 October 2018. B01044). G. Fox & Co., Hartford, CT. (18 April 1937). Advertisement: "Hurrah for Connecticut ... Made in Connecticut at Meriden, Cut Crystal Stemware... From the Silver City Glassware [sic] Co. ..." [with illustration]. Hartford Courant, p. 9. (Viewed 25 October 2018. C00320-21). Offline - see worldcat.org for locations. G. Fox & Co., presumably Hartford, CT. (20, 22 January 1939). Advertisement: "Tomorrow / Now showing G. Fox & Co.’s first housewares exposition, more than 100 vivid exhibits..." Hartford Courant. (Viewed 21 October 2018. D00350-51). G. Fox & Co., Hartford, CT. (February 1940). Advertisement: "... Feb. 10 to 17, Fox’s Fourth Annual Connecticut-Made Week... expected to have displays or exhibits... Silver City Glass Co. ... " Hartford Courant. (Viewed 24 October 2018. C00314; C00317). Kaller’s Jewelry Store, Patchogue, NY. (3 May 1940). Advertisement: "Kaller has everything for the bride... Silver City Glass Co. ..." [with no illustration]. The Suffolk County News (Sayville, New York), p. 2, cols. 6-7. (Viewed 14 October 2018. B01045). Corning Museum of Glass, Corning, NY, call. no. F-13578. G. Fox & Co., presumably Hartford, CT. (10 January 1941). Advertisement: "Starts tomorrow G. Fox & Co.’s 3rd Housewares Exhibition" [11 - c. 17 January 1941; with mention of Silver City Glass Co.]. Hartford Courant, p. 3. (Viewed 27 December 2018. D00354). G. Fox & Co., Hartford, CT. (February 1941). Advertisement: "Connecticut-made week", Fox’s fifth observance Feb. 8 thru 15th... (presumably) Silver City [Glass] Co." [with no illustrations]. Hartford Courant. (Viewed 25 October 2018. C00322-23). Corning Museum of Glass, Corning, NY, call no. Silver City Glass Co., Meriden, CT, USA. Silver City Glass Co. (c. 1951-78). Trade sign. (Cat. no. 2016.1.585. Viewed 5 July 2018. G02259). Corning Museum of Glass, Corning, NY, call no. NK5112.9.S5 .H79. Van Cott Jeweler, Binghampton, NY. (26 April 1953). Advertisement: "She wants gifts of ... Crystal... Silver City Glass... [with no relevant illustrations]. The Sunday Press (Binghampton, NY), p. 2-B, cols. 2-5. (Viewed 13 October 2018. B01030-31). (29 February 1956). Meriden firm elects new officer slate [with mention: "... Carl A. Schultz is the new president of the company, and his brother, William N. Schultz, is treasurer..." Hartford Courant, p. 12D. (Viewed 21 October 2018. D00355). (14 October 1956). Agency notes [with brief mention: "... The Charles Palm & Co., Inc., Bloomfield, Conn., has been appointed advertising agency for the Silver City Glass Company, Meriden, Conn. ..." Hartford Courant, p. 10A. (Viewed 21 October 2018. D00356). Haldeman’s Jewelers, presumably Saranac Lake, NY. (1 June 1956). Advertisement: "Haldeman’s presents Bridal Dept. 1956... Silver City Glass... [with no related illustrations]. Adirondack Daily Enterprise (Saranac Lake, New York), p. 3, cols. . (Viewed 14 October 2018. B01043). Corning Museum of Glass, Corning, NY, call no. TP868 .S58 1960r. Corning Museum of Glass, Corning, NY, call no. Silver City Glass Co.
(11 October 1961). Carl A. Schultz [president of the Silver City Glass Co.] dies: Headed Meriden firm. Hartford Courant, p. 12B. (Viewed 22 October 2018. D00358). Corning Museum of Glass, Corning, NY, call no. TP868 .S58 1962r. Corning Museum of Glass, Corning, NY, call no. TP868 .S58 1962x. Eileen’s China Shop, presumably Amsterdam, NY. (21 October 1964). Advertisement: "... Silver City Glass... " [with no relevant illustration]. Evening Recorder (Amsterdam, NY), page unknown, cols. 2-3. (Viewed 13 October 2018. B01008). (2 & 9 December 1966). Advertisement: "Feminine topics by Jacqueline... The House of Straw has MORE! ... Silver City glass... Boston Post Rd. ... Westbrook [,CT]..." Hartford Courant, [2 December, p. 7], [9 December, p. 10]. (Viewed 27 December 2018. D00359-60). The Fair Store, Binghampton, NY. (16 December 1966). Advertisement: "... One of the many pieces of beautiful Silver City glass at The Fair! ..." [with photo illustration]. Press (Binghampton, NY), p. 4-A. (Viewed 13 October 2018. B01009-10). Hamburgh House, Hamburg, NY. (21 May 1969). Advertisement: "Grand opening... Sterling on Crystal by Silver City Glass... " Photo News (Hamburg, NY), p. 7, cols. 1-3. (Viewed 13 October 2018. B01028). (14 February 1971). Meriden: New mayor spends first days getting familiar with office. [The new mayor was Robert A. Schultz, "former president of the Silver City Glass Co."] Hartford Courant, p. 14B3. (Viewed 28 December 2018. D00361). H. W. Rathbun, Jeweler, Ticonderoga, New York. (14 April 1972). Advertisement: "... Silver City Glass... " [with no related illustrations]. Press Republican (Plattsburgh, New York), p. 11, cols. 4-5. (Viewed 14 October 2018. B01042). Empsall’s Department Store, Watertown, NY. (6 April 1973). Advertisement: "... A gift for every occasion, Silver City Glass... sterling on crystal..." [with three photo illustrations]. Watertown Daily Times (New York), p.8, cols. 3-4. (Viewed 13 October 2018. B01025-26). Bernstein, Ed. (27 July 1975). Silver valued at $100,000 is stolen at firm (Silver City Glass Co.). Hartford Courant, p. 1. (Viewed 18 October 2018. B01176). "About $100,000 in silver was stolen in a break discovered Thursday morning at Silver City Glass Co. Inc. police said. A company spokesman said the silver was in the form of bars of about six or seven pounds each. ... (Excerpt from above. Silver City Glass Co. (19 August 1976). Advertisement: "Clearance on factory closeouts and seconds... 71 Parker Ave., Meriden, Ct. ..." [no illustrations]. Hartford Courant, p. 8. (Viewed 28 December 2018. D00368). Silver City Glass Company Factory Store. (6 November 1977). Advertisement: "Sterling & Gold on Crystal... Giftware Items... 122 Charles St. ..." [no illustrations]. Hartford Courant, p. 2E. (Viewed 28 December 2018. D00362). Silver City Glass Company Factory Store & Gift Shop, Meriden. (16 April 1978). Advertisement: "... Decorated double old fashion glasses... decorated cream & sugar set..." [no illustrations]. Hartford Courant, p. 18A. (Viewed 28 December 2018. D00369). Silver City Glass / Rockwell Silver Factory Store & Gift Shop, Meriden. (15 August 1979). Advertisement: "Sterling & Gold on Crystal... Giftware Items... 122 Charles St. ..." [no illustrations]. Hartford Courant, p. 68. (Viewed 28 December 2018. D00363). Silver City Glass / Rockwell Silver Gift Shop, Meriden. (27 April 1980). Advertisement: "Sterling & Gold on Crystal... Giftware Items... 122 Charles St. ..." [no illustrations]. Hartford Courant, p. 2E. (Viewed 27 December 2018. D00364). Corning Museum of Glass, Corning, NY, call no. Tableware: Silver City Glass Co., Meriden, CT, USA. (F-9612T). Silver City Glass Annex Store, Conn. Silver Co. Division. (19 March 1981). Advertisement: "... Gold Plated and Silver Plated Ware, Pewter..." Hartford Courant, p. A24. (Viewed 20 October 2018. D00365). Silver City Glass / [presumably] Rockwell [Silver Co.] Factory Store / Gift Shop, 122 Charles St., Meriden. (29 April 1982). Advertisement: "... Sterling & Gold on Crystal Barware... Glass Tableware... " [with no illustrations]. Hartford Courant, p. C10. (Viewed 20 October 2018. D00366). Silver City Glass / [presumably] Rockwell [Silver Co.] Factory Store / Gift Shop. (24 April 1983). Advertisement: "... Sterling on Gold and Crystal Barware... Glass Tableware... " [with no illustrations]. Hartford Courant, p. E4. (Viewed 20 October 2018. D00367). Online - National Heisey Glass Museum, Newark, OH. Corning Museum of Glass, Corning, NY, call no. PER NK5112.9.H4 .H4737. (Undated). silvercityglass.com: private collector website with over 25 photos of designs. (Viewed 12 October 2018. B00964-79).